A health pickup in GTA 2. Health is the measurement of the physical condition of the game's protagonist in the Grand Theft Auto series. Measurement of health on HUDs was not prominent in the original Grand Theft Auto, as the game has no indication of the player's health - players can easily die from a single gunshot, burning fire, or splash damage from an explosion. Grand Theft Auto 2, however, gave players indication of the health for the first time, measuring it using a 5-heart gauge, with each heart denoted as full, half-sized, and depleted, thus giving the health a 10-level scale. For Grand Theft Auto III, Grand Theft Auto: Vice City, and Grand Theft Auto Advance, a numbered counter, with its default maximum as 100%, is used. For other games from Grand Theft Auto: San Andreas onwards, however, a health bar substitutes the counter. In most of these games, the player's health can be extended, usually as a reward for completing one or more side missions. The color of the health counter/health bar varies between each game: orange for GTA III, pink for GTA Vice City and GTA Vice City Stories, and red for GTA San Andreas, GTA Advance, and GTA Liberty City Stories. 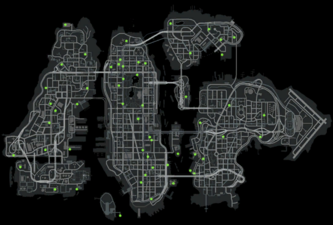 The map found on a website showing health locations in GTA IV. Health pickups scattered around the map can restore the player's health to the maximum level. Between Grand Theft Auto 2 and Grand Theft Auto: Vice City Stories, health pickups are generally shaped as rotating health icon with the symbol of a heart. In Grand Theft Auto IV and Grand Theft Auto V, health pickups are shaped as medical kits. Health can be also replenished by up to 20% when entering Ambulances. Many things can damage the player's health: being shot, stabbed, or beaten, fire, explosives, being struck by a vehicle, drowning, being thrown from vehicles, and falling from heights. When the player's health is completely depleted, the protagonist is considered "wasted", and is then transported to the nearest hospital, after which a fee for healthcare will be assessed, and all weapons confiscated (except in the iOS and Android versions of GTA III, when dating Katie Zhan in GTA San Andreas, and from GTA IV onwards). Any mission that may have been in progress at the time is considered as failed. Health can be replenished by picking up a health pickup, employing the services of a prostitute, or - in GTA San Andreas and GTA IV - by eating food or visiting a Save Point to save the game. In Grand Theft Auto III, health pickups can be found in front of all hospitals and scattered throughout Liberty City, often in recreational areas such as rest stops, parks, and shopping centers. Employing the services of a prostitute also replenishes health to a possible total of 125%. In Grand Theft Auto: Vice City, health pickups appear in Vice City primarily in front of hospitals and replenish the player's health to maximum for $100 (default 100%, which can be extended to 200%). Food stores only help you replenish up to 100% health. The player's maximum health can be increased to 150% by performing Pizza Boy side missions. The player's maximum health will be 200% after 100% completion, and can be raised up to a final maximum of 225% by employing the services of a prostitute; with 200% body armor, the maximum total health is 425%. In Grand Theft Auto: San Andreas, health pickups appear in San Andreas during gang warfare and in most missions involving a lot of gun fights. Health is replenished to maximum, which is a variable scale that can be increased by performing Paramedic side missions and exercising (sprinting, swimming, or visiting gyms). In Grand Theft Auto: Liberty City Stories, health pickups like in the previous games appear randomly around the city and always inside safehouses and by hospitals. Maximum health can be increased by finishing the Pizza Boy and Noodle Boy side-missions, with each of them increasing 25% health, when completed. In Grand Theft Auto: Vice City Stories, health pickups here appear in the same form as in GTA Liberty City Stories and are always inside safehouses and by hospitals. Increasing the maximum health requires completing the odd job, Air Rescue. In Grand Theft Auto IV and Episodes from Liberty City, health packs are found all over Liberty City, generally in out-of-the-way locales, Hospitals, and in subway stations. The player can use their Phones to call Paramedics to their location to heal them for a fee. Food stands and fast food restaurants are dotted around the city, and are great for replenishing health. A map of health pickups is shown in the game's website whattheydonotwantyoutoknow.com. The functionality of health packs in GTA IV is also extended in multiplayer modes, when it can also be used to repair a vehicle the player is in by simply driving onto a health pickup. In Grand Theft Auto V, health packs are found in hospitals as well as in each protagonist's safehouse. Health can be regenerated whenever the player's health falls below 50%; however, regeneration only works up to 50% health. Health packs are still necessary to fully recover. The player loses health if they overexert themselves while sprinting or swimming. Picking up Healthpacks or Health Pickups. Saving the game (GTA Vice City and onwards). Using health cheats (Normally not recommended to use). With the exception of saving the game, calling a girlfriend that specialises in health, hijacking an ambulance, and using health cheats (normally not recommended), all methods of regaining health require money. Health pickups were originally meant to be yellow, not red. A health pickup in GTA III (identifiable by its yellow glow), also reused for GTA Liberty City Stories. A health pickup in GTA Vice City, also reused for GTA Vice City Stories. A health pickup in GTA San Andreas. A health pickup in GTA Advance. A health pickup as a first aid kit in GTA IV. First aid packages in GTA IV. A health pickup in GTA Chinatown Wars. A health pickup in GTA V.
This page was last modified on 17 May 2015, at 17:37.